Although I cursed it in my youth, dyslexia turned out to be a blessing in disguise. Not being able to read or write until the age of ten forced me to express myself through acting. At the Stephens College playhouse in Missouri I fell in love with an actor, a married actor. That experience led to the publication of my first book (Love and Madness: My Private Years with George C. Scott). When I found myself pregnant. George wanted me to abort the baby. I refused. My friend Tammy Grimes, who later became a two-time Tony Award winner (The Unsinkable Molly Brown and Private Lives) helped me find the Florence Crittenden Home for Unwed Mothers outside of Boston, where I gave birth to our daughter. My play, Bad Girl, was based on that experience. Years later George returned to my life (Hello Again). The hardships of war and the Great Depression that mark my family's history led me to write Saturday Night Dance Club. After living in Terre Haute, Indiana, and earlier in North Conway New Hampshire, near the home of Peyton Place author, Grace Metalious, I was inspired to write Freedom's Sins, a story of scandals in a small town. Getting lost for several hours during a brief stay near the abandoned military base scared me into writing The Ghosts of Fort Ord. My nonfiction novel, Helga: Growing Up in Hitler's Germany, is based on my interview of a former member of the Jugend, Hitler's child army. My many overnight weekend getaways on the famous Queen Mary has me busily writing The Ghosts of the Queen Mary. I look forward to publishing it in the autumn 2014. I love to hear from readers of my books. Email me, follow me on twitter, or friend me on Facebook. Helga: Growing Up in Hitler's Germany is a work of historical fiction by Karen Truesdell Riehl. It is based on the true story of a young girl who was ordered to become a part of Hitler's Jugend when she was 10 years old. Helga and the other girls in her group were plied with sweets and cookies while their leaders instilled in them a fanatical love of Hitler, who was revered by them as a godlike and all-knowing being. Helga's parents had no way to counteract the programming she was subjected to, as any intervention would result in a knock on the door and their disappearance. As the war progressed, Helga was evacuated with other Jugends to a hotel where food was abundant, but there was no freedom. Their letters back home were collected and examined before sending, and any objections were swiftly and harshly dealt with. Karen Truesdell Riehl's historical fiction, Helga: Growing Up in Hitler's Germany, is a remarkable and stunning work describing a young German girl's coming of age during World War II. I found myself unable to put the book down and felt compelled to continue following her story. I've read many nonfiction and fictional works dealing with this tragic episode in history, and Riehl's work stands up there with the best. Many of us have seen movies and read stories where Hitler Youth are described as heartless, zombie-like children gleefully denouncing their parents to the Nazis and self-righteously watching as they're dragged away. Most of us probably realized it was not really all that simple and clear-cut. Helga's story helps bring a new comprehension of the strains and complexities the most vulnerable members of German society were subjected to, and how their lives and the lives of their families were affected. Helga: Growing Up in Hitler's Germany is a major and valuable addition to World War II literature. It's most highly recommended. You are Helga, only 10 years old when the maniacal Hitler decides to tear Europe apart. One day your parents receive a letter which orders you to become part of the Hitler Youth, the “Jugend.” Neither you nor your parents have a choice in this matter. So what does being a Jugend entail and how does it feel? To find the answers to these questions, Karen Truesdell Riehl interviewed Helga in 2001 and used her story to write an engaging, sometimes horrifying novel based on what actually happened in Helga’s life. Initially, Helga and her companions were excited and flattered to be one of Hitler’s chosen few. In their innocence, they did not realize how the Jugend leaders were taking control of their young minds, to the extent that if necessary they were expected to turn in their own families for anti-Hitler sentiments or behaviour. Over the course of 2 years of indoctrination, these Jugend were fed food their poor parents were denied and lived in relative luxury. Cult-like, they idolized their Fuhrer, dreaming of meeting him and passionately believing Hitler was looking after them and Germany. They couldn’t understand why their parents didn’t see Hitler as they did, as a beloved benefactor. Helga: Growing Up in Hitler’s Germany by Karen Truesdell Riehl was a riveting read. My own parents had told me of their suffering in the German labour camps. They’d described the austere, emotionless faces of the Jugend, but Helga’s story explained why they were that way. It was enlightening indeed to learn the facts. If you’d like to know the truth about the Jugend, learn it from someone who lived through it. Read Helga: Growing Up in Hitler’s Germany by the talented and prolific Karen Truesdell Riehl. Helga: Growing up in Hitler's Germany by Karen Truesdell Riehl is based on the author's 2001 interview with Helga, a former member of the Jugend, Hitler's child army. Even though many of the names have been changed and a lot of the dialogue has been fictionalized, this is still an evocative and harrowing tale. It details life for a supposed 'Aryan' in the Third Reich, who has been molded and socially engineered to believe that the Fuhrer is right and good and will protect them and Germany from harm. Helga begins when she is ten and receives a letter in the mail, inviting her to join the Jugend. Even though it's an invitation, she really has no choice about joining as suspicions abound in the Third Reich. Lured in with sweets and patriotic songs, she is soon saluting 'Heil Hitler' every chance she gets, much to her parents' disappointment. As the years pass, she slowly grows more disillusioned as she witnesses crimes against Jews and others deemed not Aryan. Friends disappear and Hitler’s promise is proven to be a farce. Soon the war finally begins to draw to a close and Helga decides to escape the Jugend and return to her family. Helga is an engaging and likable character, even in the beginning when she starts to believe the indoctrination the Jugend feeds her. As she grows older, she begins to see what is happening around her and after the war she marries an American soldier and immigrates to America. 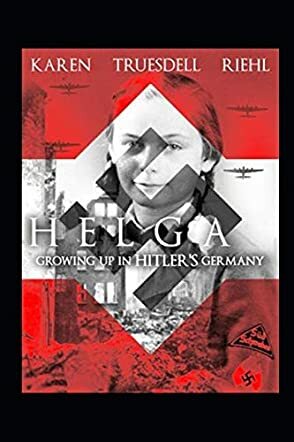 Helga: Growing Up in Hitler's Germany by Karen Truesdell Riehl is a fascinating book that showcases a different side of life within the Third Reich and how, despite propaganda and lies, there are still people willing to stand up for what is right. It was a book that was hard to put down once I started.